Crappie are a fish species that are native to North America, and are one of the most popular game fish you will find. They can be fished year round which makes them a prime target for ice fishing. These fish can be found in white and black varieties, and they prefer slightly acidic water with a moderate amount of vegetation. You can find them in rivers and ponds, but they are most often found in lakes with shallow areas of water. Crappies are found in schools which means that catching one will often lead to catching your limit. This species requires less skill than bass or carp. In general you will bring home more fish going after Crappie versus other lake fish. They are also delicious when prepared properly, so they make an ideal species with which to fill your freezer. In this article I will cover a variety of techniques to help you catch your limit of crappie. Crappie are most often found in water depths of three to six feet, so having a depth meter or a map of the lake can be helpful. They prefer to stay near cover of some kind, so logs and other underwater debris are areas to target. They also like holes, sunken islands, inlets, dams, and points. Anything that can offer shelter is a good spot to target. During much of the year they will stay in the same general areas all day. However, when it gets hot outside they will stay in the depths most of the day. They will only head to the shallows near dawn and dusk to feed. You will also find them bunch up in shallow water when they spawn. This typically happens when water temperatures reach 60F to 65F. You can fish for crappie with both lures and live bait. For lures, the best odds you will have are with small jigs. A 1/8 oz. jig is ideal and we have had good luck with Strike King’s Spinnerbait and Berkley’s Minnow Bait. Color is very important when selecting a jig as crappie have excellent eyesight. Adjust your color based on the lighting with which you will have. In clear water with normal lighting use silver or gray jigs. For night fishing try a black or dark blue. On the brightest days use brightly colored lures. The fish will adjust their eyes based on the lighting conditions, and you want a color that will be in the same range as its surroundings. For live bait, minnows work well. The best rig for this bait is a number six hook, a live minnow, and a slip bobber. This will allow you to fish any depth you like. However, this setup will also let you cast accurately around the debris where these fish hide. You also want to be sure to use the right fishing knot when fishing for crappie. You need a knot that lets the jig move freely when cast and allows for a subtle movement when presented vertically to the fish. The loop knot is ideal for this type of fishing. 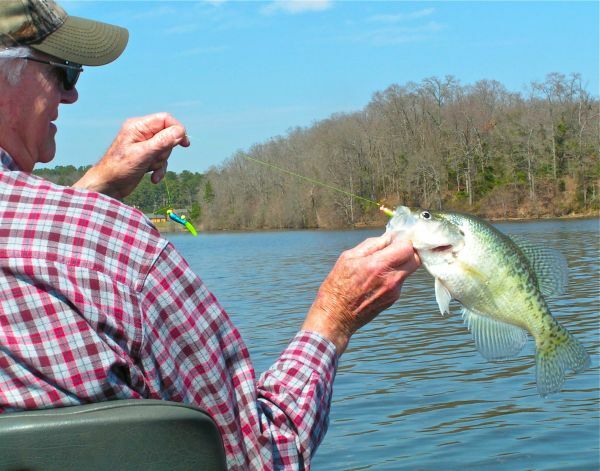 Crappie are known for having a soft lip, so a soft rod tip is essential. You want to prevent jerking the hook out of the fish’s mouth. Accuracy with your cast is also important to allow you to maneuver around logs, rocks, and grasses. 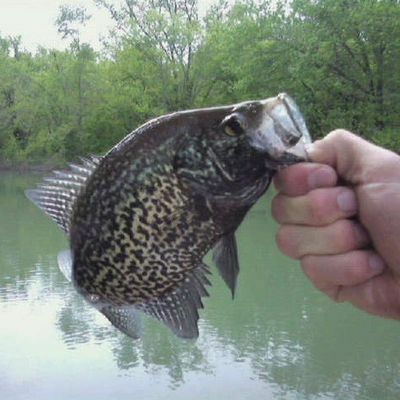 Crappie also do not get to be huge, so you rarely have to worry about your gear braking. The average fish is about ½ a pound, and they get up to a maximum of about five pounds. An ultralight or light rod weight are ideal for this fish. When fishing with live bait, hook your minnow just behind the dorsal fin. This will allow the minnow to keep swimming and do the work for you. However, jigging with artificial bait is one of the more active and delicate types of motion for fishing. One of the biggest mistakes crappie anglers make is getting in a hurry. It is easy to jerk the line oo quickly or to reel in your line too fast. The ideal crappie strategy is to drop your line in an area which you are confident has fish, and then keep it in that area until they strike. Keep your line as vertical as possible and slowly bounce the lure along the bottom bringing it several inches up off the bottom. This motion is all about using your wrist to control the tip of the rod. When the fish strikes, firmly set the hook but do not jerk the line. It does not take much effort to set the hook on a crappie, but it does take caution to keep it set. Keep the line taught as you reel in the fish. They will tend to shake your hook loose if you give them too much slack. Crappie are fighters, so you should not have much difficulty keeping the line tight. Whether a beginner or an experienced fishermen, crappie can be the most fun and most bountiful fish you can target. I know plenty of kids and teens that enjoy crappie fishing because of the consistent success. However, I know several anglers that have been fishing for sixty plus years that still go after crappie to fill their refrigerator or to prepare for a big fish fry. No matter what your motivation is, I hope that this guide will help you have more success.